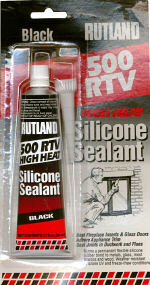 A specially formulated RTV silicone combing flexibility with high heat resistance, forms a tough rubbery seal, and keeps its flexibility even at high temperatures of 450 degrees F continuously, or 500 degrees F intermittently. Suggested uses include sealing around insulated chimney caps and storm collars, fireplace inserts, gas stoves and glass fireplace screens. Can also be used for making solar panel repairs and some automotive seals. May be used anywhere a permanently elastic rubber seal is needed. Tool joints immediately after application. Cures tack-free in minutes and usually cures fully after 24 hours.